The Kelowna Rockets will do something tomorrow that has never been done in the organization's history before, they'll face the Kamloops Blazers in a tiebreaker game. Kelowna will head to Kamloops to battle the Blazers at the Sandman Centre at 7:00 pm Tuesday night. The Blazers and Rockets finished the 2018-19 WHL Regular Season tied for third place in the WHL's B.C. Division and the final playoff spot in the WHL's Western Conference with identical records of 28-32-6-2 (64 points). The Rockets final regular season game this past Saturday night came with drama. The Vancouver Giants forced overtime with the Rockets after Jadon Joseph scored to make it a 2-2 game with only 33 seconds to go in regulation. With 1:20 remaining in the extra period and the Blazers had just finished off the Cougars, it was Mark Liwiski registering his 11th goal of the season to give the Rockets a season-extending 3-2 triumph. Head Coach, Adam Foote played in plenty of do or die games throughout his playing career, he says that he has chatted with the team about how to approach the game tomorrow. "Each guy just has to worry about what they do well," said Foote. "Every guy has one or two things that they do well that we've talked about all year. If their nerves come into play, to just skate. The good thing to remember is to skate faster and move the puck harder. Overage defender, Dalton Gally says that tomorrow's game will be just like any other game. "We know what's on the line," said Gally. "It's the first true playoff game that a lot of our team will experience, and I guess for myself as well when it comes to a tiebreaker game. It's elimination, you either move on or go home. We have to go into this game a wipe our mind clean, treat it like any other game." The Blazers were awarded home-ice advantage in the single-game tiebreaker, having finished with more points in the regular season head-to-head series with the Rockets. In 10 meetings between the two B.C. Interior rivals, the Blazers finished 6-3-1-0 (13 points), while the Rockets finished 4-4-1-1 (10 points). They opened the regular season against each other with a home-and-home series; the Blazers were victorious on home ice with a 4-1 win over Kelowna on September 21st, the next night they defeated the Rockets 3-1 at Prospera Place. They then played another home and home series; the Blazers defeated the Rockets 3-2 in overtime on December 28th, but Kelowna responded the next night with a 2-1 win at Prospera Place. The Blazers defeated the Rockets 4-3 at the Sandman Centre on January 5th. The two faced each other three times in February. 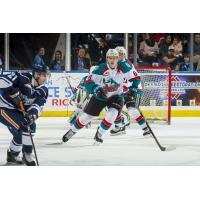 The Rockets downed the Blazers 2-1 in overtime at Prospera Place on the 2nd and 4-1 at the Sandman Centre on the 9th. They last met on February 23rd at Prospera Place where the Rockets blanked the Blazers 2-0. They rounded out the regular season series with another home and home series; the Blazers downed the Rockets 2-1 in a shootout on March 8th at the Sandman Centre, the Blazers then defeated the Rockets by the same score the next night at Prospera Place.